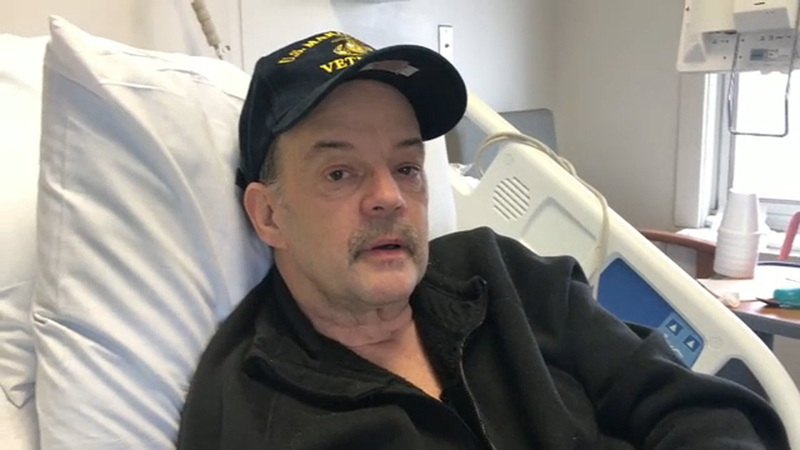 BAYONNE, New Jersey (WABC) -- A man from New Jersey who has diabetes and recently lost part of his foot claims a police officer left him on the side of the road with no way home. Kieran Walsh is still in the hospital, recovering from an infection that could cause him to lose more of his already partially amputated left foot. He says the redness and infection are the result of a grueling walk home Along Avenue C in Bayonne after his vehicle was towed by a Bayonne police officer. "It took me at least 45 minutes to an hour, because l'd pick out a set of stairs that I was going to sit in on the way home," he said. Walsh said he was stopped by the officer after the two almost collided back on November 27. The 59-year-old disabled man said the unmarked police car almost hit him, and soon after, the cop car flashed its lights. When Walsh stopped, the officer found out his car registration had expired. So the officer had the vehicle towed, which is his right. Walsh was hoping for help getting home, but he said that was not the case. "In fact, he said, 'We're not a cab service,'" he said. "Basically, find your way home." Wash's wife said she was on the phone with the officer pleading for someone to stay with her husband until she arrived from work. "That's when he says to me, 'Look, I got paperwork to do. You're wasting my time. Don't give me another reason to give him another ticket,'" Melba Walsh said. "It's just unfathomable. I just can't in my heart believe that they could do that to another human being." She is wondering why her husband, who served in the Marines and suffers from kidney illness and diabetes, would be treated so poorly. "Not to worry about his health and welfare," she said. "Not to give him a second thought, to say this guy is in distress. He's had his foot amputated. I can't walk." The police chief declined to comment, saying the case is being handled by Internal Affairs. "I'd rather have him say, you know what, I did the wrong thing," Walsh said. "I wouldn't let it happen to my worst enemy. I wouldn't want to happen to him. I would take my worst enemy home."